I'm not intending to give up on my laser cutting venture, so I thought I'd show you some of the stockade prototypes that I've been building (wall, bridge and watchtower). These are laser cut test pieces and there are a few adjustments needed but otherwise are broadly ok. You'll spot some blue and green gap filler! 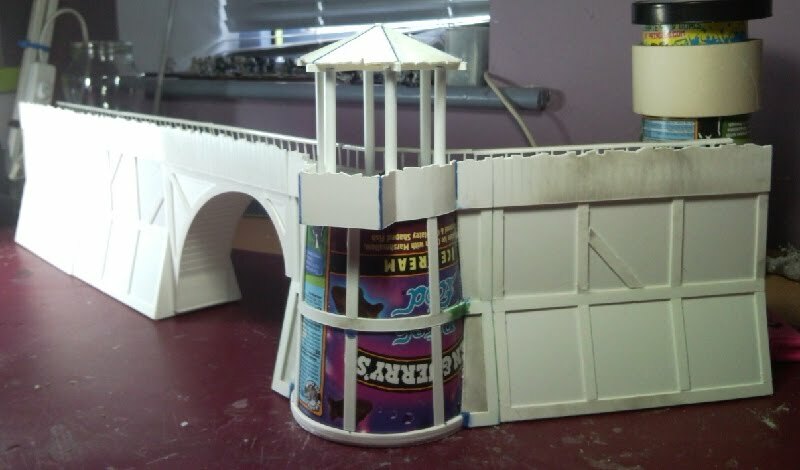 Each of the wall sections (and the bridge) are 150mm long, and the platform of the watchtower is 115mm high which exactly matches the second floor of the Pryn-Gul Tower model so will be fully compatible with that model in future. 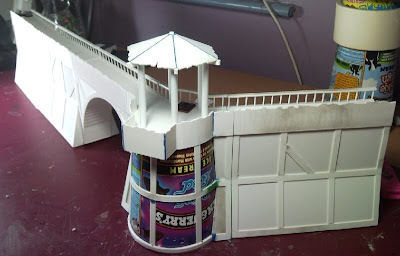 The walls are constructed from foam board which I intend to cut and put in the kits, with laser cut styrene for the shaped, ends decks, handrails, and palisades. As a guid I'm expecting each of the wall sections and bridge to be priced at around the £5 mark and the Watchtower at around £10. This copy of the watchtower is constructed with 2 wall attachment buttresses, the kit will also allow you to construct one with one or none and (by combining 2 kits) 3. There is enough palisade in the watchtower to surround the upper deck - the version I have built has the safety handrail at the back. 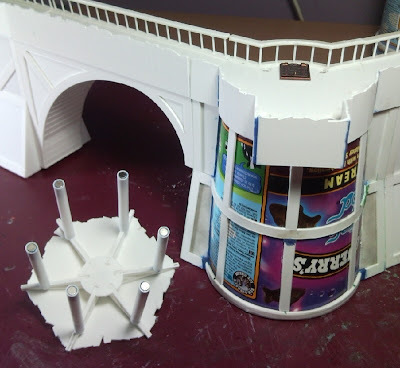 Each of the components locates to the others with 4 x 4mm disc magnets recessed into the styrene, allowing any orientation to be achieved. Magnets also position and hold the canopy in place. 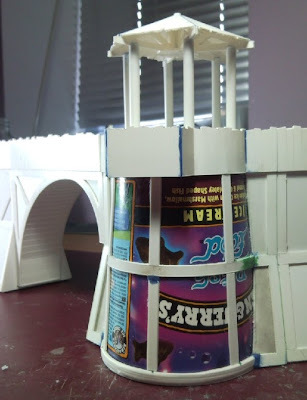 The magnets are strong enough to snap the components together and you can lift 3 wall sections by simply holding the middle one, but can easily be separated by tilting the models apart. I intend to sell the magnets as an optional extra to the kits. The trap door hatch in the watchtower is a 14mm square die-cast gun portal from a ship scale modeling company and will be provided as an optional extra... eventually! I hope that whets your appetite, and I shall try to keep you up to speed with progress, but it will be a lot more erratic and slower than previously expected. Happy to hear you're still plugging away. Your stuff looks great, though after looking through it I always have cravings for Pringles and Chunky Monkey.